This May sees the first Agents Of Change project of 2013 at the David Bloch Gallery in Marrakech. 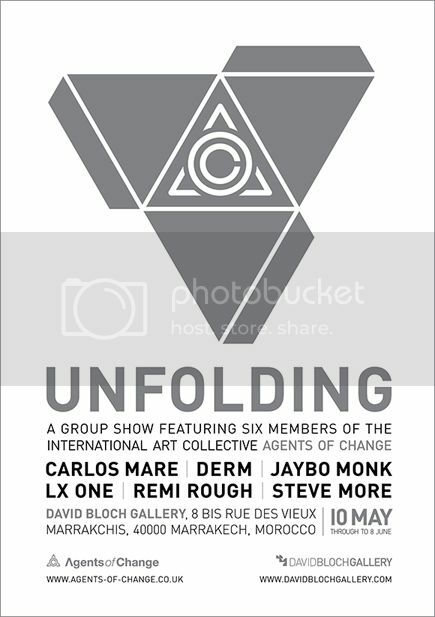 Carlos Mare, Derm, LX One, Steve More, Jaybo and myself will all be showing new work and making some external interventions too. Been looking forward to this one for quite a while. 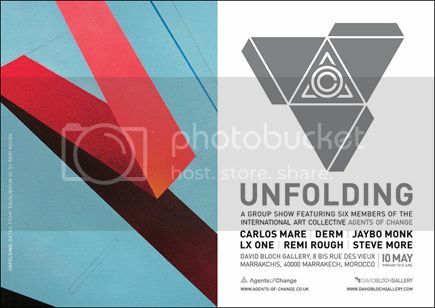 The David Bloch Gallery is proud to present Unfolding, a group show by six members of the international art collective Agents of Change, renowned for creating environmental work on a monumental scale. As well as collaborating as a collective, each artist has pursued art careers in their own right, showing to audiences throughout the world. Each of the participating artists share a common language that originated from the graffiti art explosion in the late 70’s and early 80’s. In the following decades their work has progressed and diversified to create its own distinct and refined voice. A deep-rooted understanding of form, material and space has allowed the artist’s work to unfold, expanding outwards toward new contexts. Agents of Change are a collective of 12 artists who attack space. Formed in 2009, the international collective create work that responds on a site specific basis, integrating both the aesthetic and historical resonance of the environment they’re working in. Each project brings greater potential for innovation, both on a practical level in technique and on a more emotive basis in dealing with ever larger historical and political ideas. Mare is a NYC based sculptor/ painter/ scholar/ US Cultural Ambassador who in 1985 pioneered a novel version of urban graffiti as modern sculpture. Throughout his career as a sculptor, Mare has consistently brought innovation to the genre’s aesthetic and vocabulary. His metal sculptures are inspired by his interests of form, light, space in an architectural environment. His admiration of early avant-garde art and sculpture inspired the merging of aesthetics between ‘graffiti’ styles and the modernists of the early 20th century. Derm’s work is based on a combination of abstracted typographical forms, architectural influences, and graphic and geometric shape. Taking inspiration from the colours and textures of the natural, urban and industrial environments in Scotland, he makes work in found spaces that responds to and comments on the aesthetics of its environment. David Bloch Gallery is located at 8 bis rue des Vieux Marrakchis, 40000 Marrakech, Morocco, and Unfolding will run from May 10 to June 8.